NORTH, SOUTH, WEST, EAST, SCOTLAND, Route ideas and places to go. MountainViews Gathering MountainViews February bash has great speakers, awards and a great buzz. Faughart: Small hill, huge history This summit was recently added in the Local Historical and Cultural class. The MountainViews ANNUAL An inaugural Annual magazine coming shortly. The MOUNTAINVIEWS Gathering will take place on Friday, 19th February 2016 in the Lansdowne Hotel, Dublin 4. 7:30pm. John G O'Dwyer, who has written on Pilgrim Paths in Ireland and has an occasional column in the Irish Times will speak on Stories from the Irish Landscape. Mike Maunsell of Mountain Research Ireland will also speak. Other supporting speakers will be Peter Walker & Simon Stewart. The usual annual awards for complieters and contributors will take place. March, 2016. (Provisional) Lenny Antonelli on Canal Walks. April, 2016. (Provisional) Tom Egan on Tracks & Trails at Lough Boora. 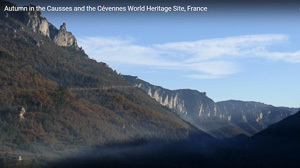 Meetings are organised by the WAI with the help of the MountainViews committee. Talks are held in the Landsdowne Hotel, 27 - 29 Pembroke Road, Dublin 4 unless otherwise stated. For the Gathering there is a charge. The other events are free to enter with a voluntary collection. Directions here www.lansdownehotel.ie . The excellent bar facilities allow you to have a drink with other hillwalkers after the event. You can get a meal before the meeting also. Should you wish to stay overnight then please consider staying with the Lansdowne. Views taken going up Caoinkeen SE Top by thomas_g Lough Nambrackderg & Lough Beg (right) with Conigar on the right skyline. North and east (and indeed west, if you're being honest) of Knockboy lies a large tract of wilderness ill-served by a spindly network of rickety roads. 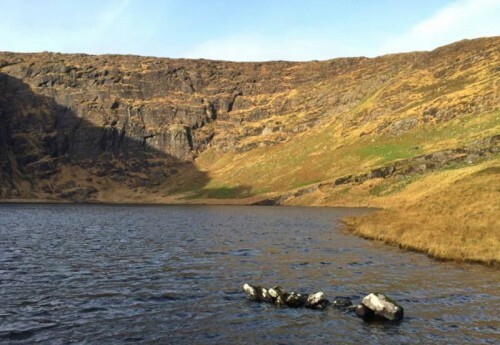 This month's featured track from thomas_g serves as a relatively brief sample of this fascinating area, including a girdle of remote Lough Nambrackderg, some scrambling and an ascent of the recently listed Arderin Beg of Caoinkeen South-East Top. The accompanying notes give some good tactical advice and the photos communicate the ground to be covered well. Those interested in the higher summit of Caoinkeen are referred to mvtrack3037. This route starts at the highest point of the road above the Borlin valley. There is a well used track down to close to Lough Nambrackderg, following the shoreline it's possible to get around a new fence by walking out into the lake on some stones, this is preferable to trying to climb the fence which is high and would easily be damaged by climbing over it. There are stiles for the other fences on the walk so perhaps one will be placed here too. You can see a short detour on the south side of Nambrackderg, this is a track which leads up to a very usable grassy gully. On this occasion I decided to tackle the spur between Lough Nambrackderg and Lough Beg, which is a good scramble with some unprotected moves and quite slippery in spots (not surprising given the 150mm of rain in the past 2 weeks). Neither the gully or the spur shown on this track are suitable for people without scrambling experience, if you'd like an easier ascent or are with a mixed group, I'd suggest the spur to the south of Lough beg. Looking back down the spur towards the lakes. There are a few rock steps which can be outflanked if required. Eventually the spur deposits you in a flattish area where there is a fence to follow in the direction of Caoinkeen SE. Once there, there are a few candidates for the summit proper. It would be a straightforward walk over to Caoinkeen top, but on this occasion I decided to head back for the car instead. The route from the summit passes a small tarn which is surrounded by a fence and leads to a small lake at 559m. From here you can take the scenic route like I did to get views to the valley to the north and Lake Nambrackderg, or take the direct route down the spur. Like the ascent, there are some rock steps to work around, but there is a helpful fence to lead the way (although not always the easiest way): I suggest you choose your own route down - it's more fun and will stop a permanent track being made. I was a bit dissapointed to see vehicle tracks in places, it somewhat spoils the lovely sense of isolation one gets in this area. The fence leads to the road just a few 100 metres from the car. It's worth noting that I was really taking my time, you could probably knock an hour off this time if you were in a rush. NORTH: Hill of Faughart: "New" hill, much history. Member Trailtrekker excelled himself on this one. First he suggested the summit by way of MV's "Propose Places Database Change". After this was accepted as a Local, Historical and Cultural hill he has gone on to describe the summit area. The notes on the summit show what a turbulent past it has had. This extends right up to modern times such as "The first body of one of the disappeared was returned at this hill, that of Eamonn Molloy on 25th May 1999." Its earlier history reads like something out of Game of Thrones or is it the other way. An interesting place to visit in north Louth very near the border. Over 200 changes to basic summit information were proposed (nearly all accepted) during 2015 over 20 of which were new summits. You can propose any change yourself. Anything from alternative names to the proper county or Mountain Area / Subarea or the height. Wet and slippery it may be, but the ascent of Slieve Commedagh in the Mournes rewarded simongray12190 with sightings of a peregrin falcon and spectacular scenery. simongray12190 on Slieve Commedagh, (Sliabh Coimhéideach): Steep and slippy but great views! 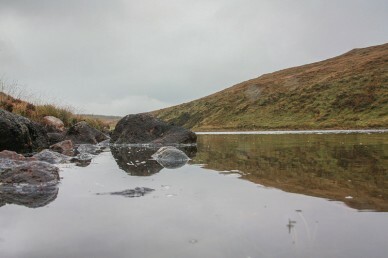 If you're a huge fan of Christmas puddings then there are few more appropriate hill ranges in Ireland than the Sperrins, where you can traipse over uplands that resemble soggy festive desserts all year round. ulsterpooka's circuit from the bridge on the Goles Road is as decent an example of a medium-length walk as you could find hereabouts, with tough going over six summits largely following the fences that are almost as emblematic of the range as the bogs and the knee-deep vegetation. The final gap between Crockbrack and Mullaghsallagh is especially entertaining, seeing as it involves dropping down to a valley floor and climbing back out again...all good character-building stuff. Eagles Rock in the Cooleys is an impressive formation reports Hivisibility, but can be very dangerous especially in wet conditions. hivisibility on The Eagles Rock: Slippery when wet! Place-to-place frolics from Connemara now, as heldon submits a track crossing the less frequented part of the Twelve Bens area, climbing over the twin summits of Garraun and skirting the substantial mass of Doughruagh and passing the famous monastic community at Kylemore. The route largely follows an old track over the higher ground, and there are possibilities to add at least five further tops to the walk without too much diversion. WEST: A dry run – for a change. Walkers ascending Annatoran in the Ox Mountains usually tell soggy tales of sodden ground and sloshing through mud. Gerrym has a rare dry and pleasant ascent. gerrym on Annatoran: Dry is Best! The Ox Mountains squat in a slightly sulky fashion to the south-west of Sligo town, deeply cogniscent of the fact that much more attractive hills are rearing up close by. 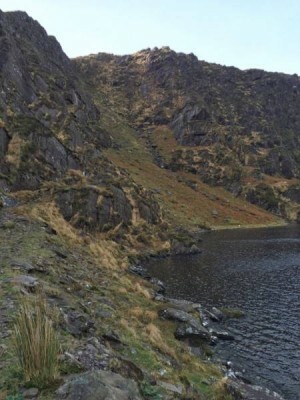 Undeterred, mountainmike has uploaded a traverse of the eastern end of the range from Doomore to Cloonagh, and he has included copious notes both with his track and with his comment on the former summit. The intrigued should note the need for transport to the start or from the end, and the determined could keep going across the higher reaches of the range. 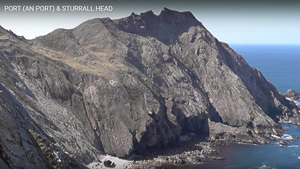 The Bluestacks rear up in a distinctly uncompromising manner from the deep gash in the landscape carrying the N15 to Donegal town, but this throughfare provides one of the more convenient starting points for a group usually necessitating awkward drives along very minor roads. simon3 has raided his archives for a fine traverse from this direction, taking in five (and possibly one or two more with diversions) summits and an awful lot of ground that's tough underfoot and very entertaining when the mist is down. Barnes Lough from the east. One wettish September day we visited the SE corner of the Bluestacks starting from Barne's Bridge on the N15 Ballybofey to Donegal Town road. There was reasonable parking and a forest road that lead invitingly into the mountains. When you leave the forest road you are in a wild area and the day we did it the mist was off the first couple of summits but all the higher ground required continuous navigation. 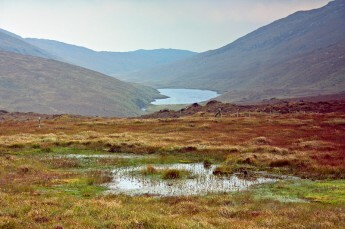 An initial and a finishing sight was that of Barne's Lough, part of the Barne's River. Approaching Cloghervaddy after Croaghbrack you are in a truly wild, trackless area without any sign of the built environment. Looking at the route on the modern MV map I see we didn't visit Croaghnageer NE or Croaghnageer E both of which were only added in 2015. The mist conditions were such that photography wasn't possible, not until we got right back to Barne's Lough was it possible to get the camera out with any hope of getting a shot. Even then I note the picture has clear signs of water droplets on it. All in all, a great short walk. SOUTH: Stunning vista in Cork. Some rare December blue sky affords Thomas_g the chance to snap some spectacular scenery on Coainkeen SE Top in Shehy/Knockboy. SOUTH: The four tops are a big hit. Beenatoor in Central Dingle is the last stop on an excellent, four top trek, providing mountain, valley and sea views, recounts ahogan. The Fern Path makes for a relatively easy trek up Camaderry SE Top in Wicklow, says Simon 3.
simon3 on Camaderry South East Top: The Fern Path. Edinburgh is a marvellous city for the visitor, a place where a vast amount of history is stained into the dark volcanic rock. It's also a place where you always seem to be walking uphill, and so it was that a slightly hungover track reviewer spent the morning after a friend's 40th birthday party climbing the highest of the Burgh's legendary (but actually quite lazily identified) Seven Hills. Arthur's Seat is an excellent shortish walk starting from Holyrood Park and reaching the top along the dramatic crest of Salisbury Crags. This whole area has a very genuine municipal park vibe to it and can largely be explored at random if you avoid the obvious excessively steep ground. Gallery - Over 500 photos were uploaded to MV in 2015, this will be a selection. A group of Norwegians has launched a campaign to shift their country's border by 200 metres to bring the peak of the Halti mountain into Finnish territory as a gift to their mountain-deprived neighbour for the 100th anniversary of its independence. Moving the border between Norway and Finland just 150m to the north and 200m to the east would bring Finland a new highest peak while losing Norway just 0.015 square kilometres. At 1,365m, Halti does not even make the list of Norway’s highest 200 peaks. But one of its lower spurs, Hálditšohkka, marks the highest point in Finland, at 1,324m. 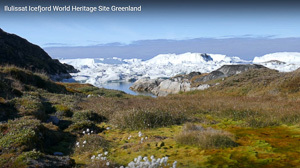 “My idea is that this should be a gift from the Norwegian people and I feel sure that the Finnish people would appreciate it,” said Bjørn Geirr Harsson, the retired geodesist behind the Facebook campaign. Read more about it. Perhaps Northern Ireland could benefit from a few more summits? Its already got a bit of Cuilcagh, perhaps the whole of it? (Although having seen what the local authorities on the northern side have done maybe the entire mountain should go to the Republic). Or perhaps you have suggestions for gifts from NI to the Republic? Suggestions welcome. But stick to the principle of the Norwegian campaign which is about a limited area around a mountain. Just because it is 2016 does not mean that big R republicans should start looking for the whole of NI or, for that matter, big U unionists looking for the Republic to come back to the UK. Not on MV anyway. Esteemed member aidand made an interesting proposal. We hope to include an item on "Walk of the Year" from various people in our forthcoming "MountainViews Annual"
In the meanwhile do take a look at the item and the various replies to aidand's call. Love hillwalking enough to get wound up about it? Unbelievable (but hilarious) review via The Daily Mail. Truly, some people haven't a clue. The Challenge Calendar Notes will resume later this year. In the meanwhile you can look at the calendar to see our reports from this year and plan what you would like to do next year. 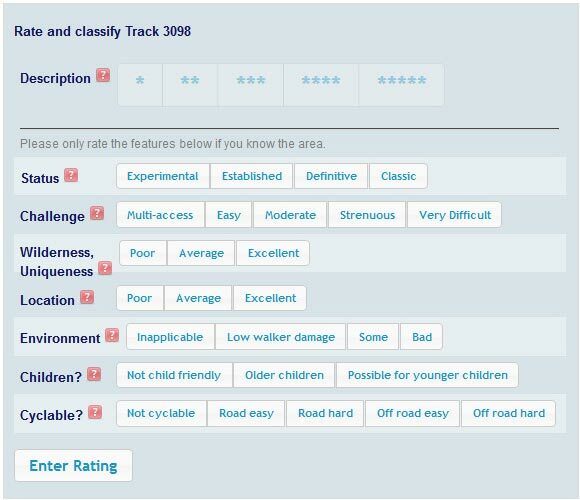 So two main points are: to make the shared tracks useable by everyone else; and reward contributors for their quality descriptions! Nephin - newly suggested east route. The Gribbons, The Gribbon Sublists and Gribboneering. Kieron Gribbons published a book some years ago on the County Highpoints. You may recall MountainViews published a review of this in April 2014 written by member Aidan Dillon. "Welcome to High Point Ireland - the official online home of the Gribbon list and the Gribbon sub-lists compiled by Kieron Gribbon. 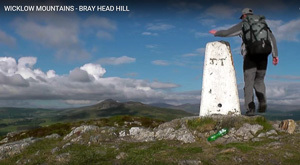 Together with the book The Gribbons: A Complete List of Ireland's Major Geographical High Points"(also by Kieron Gribbon), the High Point Ireland website is the hub for the activity of Gribboneering." You can decide for yourself whether this approach is one that meets your favour. In due course we will review his new book. In the interests of hearing his point of view, we (or the Walkers Association) attempted on a couple of occasions to arrange a speaking occasion for Kieron following his original book on County Highpoints. 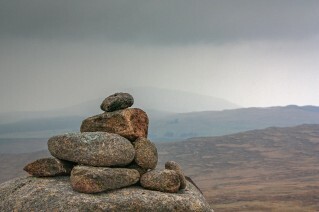 Hillwalking in Ireland needs innovation and also discussion as to what is useful to the sport. and these shared tracks Arthur's Seat, Firth of Forth to the River Tweed Britain, Caoinkeen South-East Top, Shehy/Knockboy Ireland, Croaghbrack, Bluestack Mountains Ireland, Doomore, Ox Mountains Ireland, Garraun, Twelve Bens Ireland, Knockalongy South-West Top, Ox Mountains Ireland, Knockmealdown Mountains Ireland, Mullaghsallagh, Sperrin Mountains Ireland, Nephin Beg S Top, North Mayo Ireland tracks were created. Thanks to all 1221 who have ever contributed summits or routes info and forums. Summary. MountainViews now has 7798 comments about 1423 different hills & mountains out of the total in our current full list (1496). We want to get a good gps track showing each of the major ways up every summit in Ireland. If you see an option to add a "Short Summary" then do please consider creating one since another objective is to have a short summary for every summit in Ireland. There's a few (73) opportunities for you to be the first to comment on a summit. We also have around 1500 shared GPS tracks, mostly in Ireland. Apart from a few popular areas, there is a need for more routes in many different areas. Plain shared tracks without descriptions are welcome however if you have time then do please add route descriptions with photos.